As dramatic as oils on canvas can be, the intricacy of a tapestry can transform the same work of art into something a lot more elegant, and refined. Thatai??i? 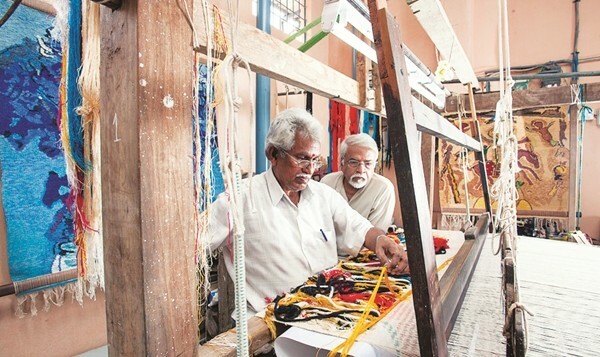 ?s the underlying teme at Painted Weaves, a show of silk tapestries by veteran artist SG Vasudev, at Gallery Sumukha. Chennai. Vasudev is a founder member of the community, which was established in 1966 by the late former principal of the Madras School of Arts, KCS Paniker. Tapestry, as an art form, finds takers in the most select circles, in regular shows at The Metropolitan Museum of Art, New York, for instance. 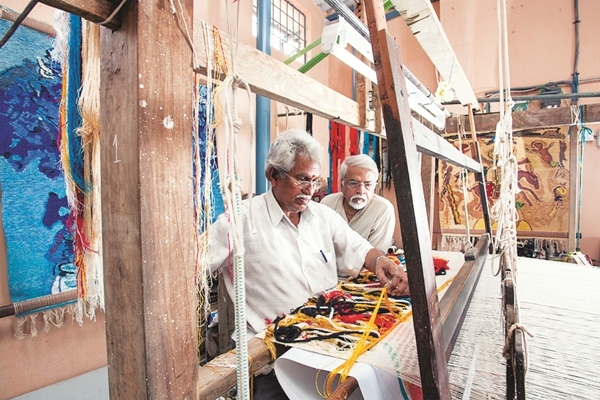 In India, however, the delicate weaves of indigenous crafts groups at prominent centres from the South all the way up to Varanasi, Uttar Pradesh, rarely gain much by way of promotion ai??i?? 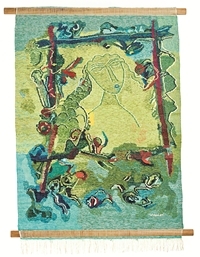 barring retail avenues for highly priced dhurries and wall-hanging rugs catered to star hotels and luxury properties. even as they require a very different manner of appreciation to grasp the painstaking work that goes into the making of these masterworks. The works at Painted Weaves are very much in line with Vasudevai??i? ?s prodigious oeuvre, spanning paintings, drawings and murals to crafts work in copper, ceramics and wood. His chosen themes at the show are familiar, such as Vriksha (ai?? ?Tree of Lifeai??? ), Maithuna (ai?? ?Act of Loveai???) and ai?? ?Theatre of Lifeai???. As in his paintings, the artist is consumed by what he describes as ai???Humanscapesai??? and ai???Earthscapesai?? ?, liberally infusing his abstracted canvases ai??i?? or mantles and drapes, in this case ai??i?? with elements of birds, animals, and everyday motifs. While Vasudev frequently bases his works on the union between man, woman and nature, his silken weaves deliver the spotlight on that crucial in-between link, of material and substance.